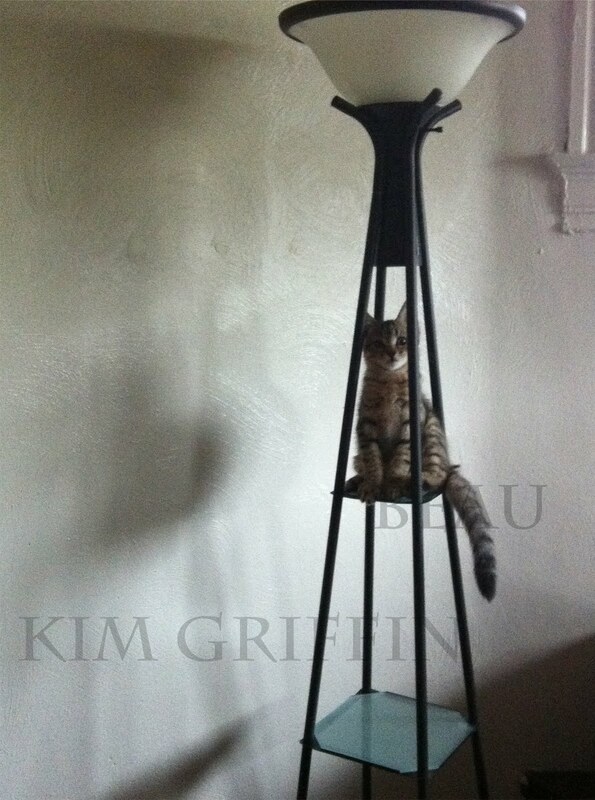 Donna and the Bears: Kim's "Beau"
Photographing with her Iphone, Kim captured sweet little Beau just after he performed one of his feats of agility when he jumped onto a shelf on her lamp. This is one of the most brilliant photos I've ever seen - even if I didn't know the subject and photographer personally! Kim mentioned that little Beau is growing so quickly, he won't fit on that shelf much longer. I am amazed that the lamp is still standing! This is such a cute picture, perfect timing. I have 3 cats myself and every day is something different to explore and I love taking pictures of them doing silly things also. On Kim's behalf, thank you so much, Hanni! I know your kitties bring much joy and laughter to your life as ours do. They are such a gift! Thank you for taking the time to write and I shall pass along your comment to my daughter!